Sonic, as seen in Mario & Sonic at the Olympic Winter Games. 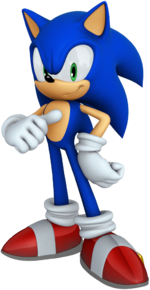 Sonic the Hedgehog is the eponymous main protagonist of the Sonic the Hedgehog series of video games. He has been Sega Corporation's mascot since June 23, 1991 after replacing the previous mascot Alex Kidd. Since the beginning of the series, Sonic has been the champion of peace, risking his life to stop the plots of a variety of violent foes, particularly Dr. Eggman, in order to establish worldwide peace. Along the way, he has been aided by many characters, including his friends Miles "Tails" Prower, Knuckles the Echidna, Amy Rose, and Shadow the Hedgehog. Sonic's greatest asset is his ability to run at supersonic speeds. However, he is also prone to making rash decisions and dislikes being near water because he cannot swim with certain exceptions. Sonic has appeared in crossover titles alongside Mario in the Mario & Sonic series and the Super Smash Bros. series. For the first two Mario & Sonic games and Super Smash Bros. Brawl, Sonic was voiced in English by Jason Griffith, his at-the-time current voice actor in the Sonic the Hedgehog series. However, as of the release of Sonic Free Riders and Sonic Colors in 2010, Roger Craig Smith currently provides the English voice of Sonic. In April of 1990, Sega requested a game that would be capable of selling at least one million copies, being able to both compete against Nintendo's Mario and replace their at the time current mascot, Alex Kidd. Several character designs were submitted, and eventually the mascot they selected was a spiky teal hedgehog named "Mr. Needlemouse", who was later renamed Sonic, submitted by Naoto Oshima. Some of the original concepts for Sonic depicted him as being in a band, as well as a human girlfriend named Madonna who would have played a similar role to Princess Peach in Super Mario Bros., though these were scrapped during development. After a few minor adjustments and redesigning, Sonic Team developed the first title in what would become the phenomenally successful Sonic the Hedgehog series. Nintendo and Sega were business rivals throughout the 1990's, though mostly during the competition of the Super Nintendo Entertainment System and the Sega Genesis / Mega Drive. As such, Nintendo and Sega often attempted to put each other down in their games. Examples of Nintendo mocking Sega include the "No Hopers" sign in Donkey Kong Country 2: Diddy's Kong Quest, and possibly the Harry Hedgehogs of Super Mario World 2: Yoshi's Island, while examples of Mario mockeries in the Sonic the Hedgehog series forms of media include the emphasis on "Super" on the back of Sonic the Hedgehog's box (a reference to Super Mario Bros. and other Mario series titles beginning with "Super") and the Marxio Brothers of Sonic the Comic, a British comic book about Sonic and his friends. Their rivalry lasted until 2001 when Sega left the console manufacturing market with the discontinuation of their last console, the Dreamcast (in America and Europe) and became a third-party game developer. The first Sonic games for a Nintendo system were Sonic Advance for Game Boy Advance and an enhanced port of Sonic Adventure 2 for the Nintendo GameCube, titled Sonic Adventure 2: Battle. Both were released simultaneously in Japan. 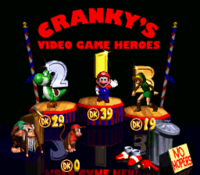 In the Cranky's Video Game Heroes awards ceremony in Donkey Kong Country 2: Diddy's Kong Quest, Sonic's shoes and Earthworm Jim's plasma gun can be seen next to a trash can, along with a sign saying "No Hopers." This detail was removed for the Game Boy Advance port, released after Sega became a third-party. Sonic competes against Mario and others in Olympic events in the game Mario & Sonic at the Olympic Games. He is a Speed character, meaning he has great speed, but low power. Sonic wears a blue life jacket during the swimming events, since he can't swim. He still moves quite fast in water too. Sonic, once again, crosses over with Mario in Mario & Sonic at the Olympic Winter Games. As in Mario & Sonic at the Olympic Games, he is a Speed type character and is the fastest one in the game. In the Adventure Tours mode for the DS version, Bowser and Dr. Eggman team up to ruin the 2010 Olympics. Bowser melts all of the snow at the event, and Dr. Eggman kidnaps all of the snow spirits to prevent any snowfall. Sonic and Mario team up in order to ruin Bowser and Dr. Eggman's plans to ruin the Olympics and to save the snow spirits. Sonic makes yet another crossover appearance with Mario and friends in Mario & Sonic at the London 2012 Olympic Games. Like in the previous two installments of the series, Sonic is a Speed type character. This game is notable for being the first in the series to feature Roger Craig Smith as Sonic's new voice actor. Sonic has dialogue for the Wii version of the game in the London Party mode, but not the 3DS version's Story Mode. In the 3DS version's Story Mode, Sonic is first seen with Miles "Tails" Prower just arriving at London for the Olympic Games. Not long after the two arrive, fog starts rolling in, though the fog is red. Sonic and Tails decide that this is Bowser and Eggman's doing and later meet up with Mario, Luigi, and Toad to put a stop to the evil villians' plot. After their defeat, Bowser and Dr. Eggman claimed they never got their invitations to the games which is the reason why they started the plot. As it turns out, they mistaken their invitations for love letters since Princess Peach and Amy wrote them. After clearing up the problem, Sonic, Tails, Mario and Luigi invite Bowser and Dr. Eggman to the Opening Ceremony and to compete in the Olympic Games. Sonic also appears as a playable character in Mario & Sonic at the Sochi 2014 Olympic Winter Games. He is once again a Speed type character. Sonic returns as a playable character in Mario & Sonic at the Rio 2016 Olympic Games. In the 3DS version, Sonic, along with Mario, can be used in any of the game's events. This is the first Nintendo 3DS Mario & Sonic game to give Sonic in-game text dialogue, as opposed to his silence in previous games. Sonic bounces onto the stage from a Spin Dash. Sonic is an unlockable playable character in Super Smash Bros. Brawl, and, alongside Solid Snake, is one of the first two non-Nintendo characters to appear as playable characters in the series. He can be unlocked by playing 300 Brawl matches, completing Classic with ten characters, playing ten hours of Brawl matches, or by having Sonic join the party in The Subspace Emissary; with any of the first three methods, the player must then defeat Sonic on Green Hill Zone. 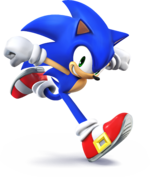 Sonic was not originally planned to appear; he was included during development in 2007, making him the final character created from the ground-up to be added into the game. Sonic is the fastest character in the game, with fast attacks and movements. Several of Sonic's moves are based on those he uses in his games. His standard special is the Homing Attack, which involves him flying right into opponents, his down special and side special are Spin Dash and Spin Charge, respectively, which both involve him curling into a ball and ramming into opponents, and his up special is Spring Jump, which involves him leaping up off of a spring from the Sonic series. His Final Smash move is using the Chaos Emeralds to transform into Super Sonic, allowing him to fly around the stage to attack. Sonic's victory theme is directly taken from the 2006 Sonic the Hedgehog game, that tune being a remix of the "Act clear" theme from Sonic the Hedgehog 3 and most Sonic games after that. Sonic does not appear in the Subspace Emissary until the very end, after The Great Maze, making it a surprise appearance. As when every fighter makes it to where Tabuu resides, he prepares his Off Waves, which would have turned every character into a trophy. As soon as he's about to release the attack, a dashing blue blur dashes past the fighters, and rams into both of Tabuu's wings; causing the Off Wave attack to fail. As the blue blur jumps up on a "peak", he reveals himself to be Sonic. While he taunts, Tabuu's wings break apart, and then six fighters are selected to fight Tabuu in the final battle. Sonic, along with Jigglypuff, Squirtle, Toon Link, Wolf O'Donnell, and Zero Suit Samus, are the only characters that are never seen as trophies in The Subspace Emissary. Sonic reappears in Super Smash Bros. for Nintendo 3DS and Super Smash Bros. for Wii U as a playable character making him the first veteran third-party character. This time, however, he is available from the start. He is also now voiced by Roger Craig Smith in English instead of Jason Griffith. He is also now voiced by a different voice actor in different regions (e.g., he has a French voice in France). His appearance has been updated to reflect his design in his more recent games such as Sonic Colors, which in turn are based on official 2D and CG artworks. His moveset is almost completely unchanged from Super Smash Bros. Brawl; the only real change is that his down smash from the previous game (a back-and-forth Spin Dash) has been replaced with a split-kick. One of his alternate colors in this game seems to be based off Silver the Hedgehog. Along with Sonic himself, a stage based on Windy Hill Zone from Sonic Lost World makes an appearance in Super Smash Bros. for Wii U as well as the returning Green Hill Zone appearing in Super Smash Bros. for Nintendo 3DS. Sonic returns as a playable character in Super Smash Bros. Ultimate. Like Super Smash Bros. Brawl, Sonic is an unlockable character instead of being available from the start. Sonic's basic moveset appears mostly unchanged aside from his dash attack, the latter of which has been changed into a lunge kick. Sonic's Final Smash, Super Sonic, returns, but Sonic travels much faster than before, and he moves automatically at multiple angles, in a vein similar to Pac-Man's Final Smash. Both Green Hill Zone from Super Smash Bros. Brawl and Windy Hill Zone from Super Smash Bros. for Wii U return as well. In the World of Light trailer, Sonic tries to run away from Galeem's large laser attack, but slows down in an attempt to save Pikachu, but fails, with both of them getting eliminated by the lasers and turned into dark clones. The Homing Attack is one of Sonic's moves appearing in most games in his series since Sonic Adventure, and his standard special move in the Super Smash Bros. series. When used, Sonic curls up into a ball and hovers in the air before charging down and forward, hitting any nearby opponents. The player can also have Sonic immediately charge forward by pressing the special attack button again, though the move is weaker as a result. The Homing Attack causes Sonic to bounce off of the opponents if it hits, in addition to walls and the ground if it misses. In Super Smash Bros. Ultimate, crosshairs briefly appear on Sonic's target when the Homing Attack is used. The move is also used by Knuckles when he is summoned from an Assist Trophy. In Super Smash Bros. for Nintendo 3DS / Wii U, the Homing Attack is given two custom variants. The first is Stomp, another move from the Sonic the Hedgehog series that causes Sonic to slam directly downward into opponents and meteor smash them. The second move is Surprise Attack, which is faster, but Sonic stays in place while charging and the attack sends Sonic into the air a little, giving the move less range. The Spin Dash is Sonic's side special move, based on the move that he has had in the Sonic the Hedgehog series since Sonic the Hedgehog 2. Rather than rapidly pressing the button like in the Sonic games, the Spin Dash in the Super Smash Bros. series instead charges by holding down the special attack button. Sonic curls up into a ball as the move charges, and when the button is released Sonic charges forward, damaging any enemies in his path while doing a small hop at the beginning. The player can change the direction of the dash by tilting the control stick in the other direction. Players can also jump while dashing by pressing any button. In Super Smash Bros. for Nintendo 3DS / Wii U, the Spin Dash has two custom variants that can be unlocked: Hammer Spin Dash and Burning Spin Dash. Hammer Spin Dash causes Sonic to leap into the air and slam the ground upon dashing, burying any opponents beneath him, though the move does not have as much attack power. Burning Spin Dash has a fire effect, but does not have the hop at the beginning of the move. Spring Jump is Sonic's up special move. When used, Sonic pulls a Spring from the Sonic the Hedgehog series and uses it to bounce really high in the air. He can use this both on the ground and in mid-air. If he uses it on the ground, it stays on the ground, allowing him and other characters to bounce on it as well. Sonic cannot do damage when using the spring; however, he can still use his aerial moves (but no special moves) afterwards (one of very few up special moves that can do so). When the spring falls in midair and hits an opponent, it sends them straight downwards and deals some minor damage. Sonic can also use this move to recover from getting knocked off the edge of a stage. In Super Smash Bros. for Nintendo 3DS / Wii U, Spring Jump has two custom variants: Double Spring and Springing Headbutt. Double Spring gives an extra spring, but reduces the jump height to compensate. Springing Headbutt allows Sonic to attack on the initial jump, but the spring disappears when it hits the ground and the jump is also slightly lower. The Spin Charge is Sonic's down special move. It is a Sonic technique that originated from Sonic the Hedgehog 2. The attack is very similar to the Spin Dash, but it has the potential to move faster. If Sonic uses this attack, the player must tap the special move button repeatedly to charge the attack even further. Charging it up gives it a huge power and speed boost, more so than the Spin Dash's charge. When the player taps the special move button but doesn't keep tapping it, Sonic will stop spinning, which could fake out the opponents. The attack is also very similar to Jigglypuff's Rollout attack. 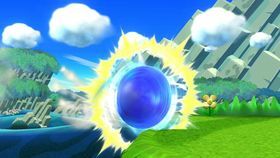 In Super Smash Bros. for Nintendo 3DS / Wii U, the Spin Charge has two custom variants: Auto-Spin Charge and Gravitational Charge. Auto-Spin Charge removes the need of tapping the B button repeatedly for it to charge. Gravitational Charge pulls opponents in front of Sonic and towards him, then pushes them behind him and away from him. Super Sonic is a form that is taken by Sonic when he collects the seven Chaos Emeralds that appears in many installments in the Sonic the Hedgehog series, first appearing in Sonic the Hedgehog 2, and also appears as his Final Smash. When activated, the Chaos Emeralds appear around Sonic and transform him into Super Sonic, allowing Sonic to freely fly around at high speed, ramming into opponents to deal damage. After some time, the transformation ends and Sonic returns to normal. The player cannot self-destruct while using this Final Smash, as Super Sonic cannot fly past the stage's blast lines. In Super Smash Bros. 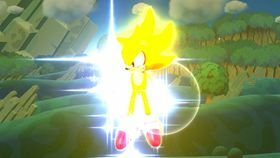 Ultimate, the Final Smash is now automatic, and instead has Super Sonic flying rapidly across the screen multiple times, damaging anyone he hits. The artwork of Sonic from Mario & Sonic at the Olympic Winter Games is seen on the Mii Racing Suits screen of Mario Kart 8 and Mario Kart 8 Deluxe. Upon scanning the Sonic amiibo onto the , a racing suit stylized after him will be accessible to the player; this suit can be used on the Mii. By tapping Sonic's amiibo into Yoshi's Woolly World and Poochy & Yoshi's Woolly World, Yoshi will transform into an appearance based off of Sonic, sporting blue skin with flesh-colored arms and chest, Sonic's shoes and gloves, and green eyes. Sonic the Hedgehog appears as one of the costumes available in Super Mario Maker. The costume can be unlocked by playing 100-Mario Challenge or by tapping Sonic's amiibo onto the Wii U GamePad, and can only be used with the Super Mario Bros. style. The sprite used for Sonic is 16-bit, being based on his sprites in the original Sega Genesis / Mega Drive Sonic the Hedgehog game. Collecting the Mystery Mushroom giving the player this costume plays the 1-Up tune from the 1991 game Sonic the Hedgehog, and all of Sonic's sound effects are taken from the original games. Pressing causes Sonic to look up while playing the Ring-collecting sound. Finally, Sonic's "course clear" and "lose a life" fanfare are the course clear and game over fanfare, respectively, from Sonic the Hedgehog 3. The fastest hedgehog in the world, this little blue speed demon often gets going so fast, he appears to be just a whirling blur. He'll usually be found in front of any of the speed-based events in these Olympic Games, and will be very difficult to catch in any of the short-distance sprints. 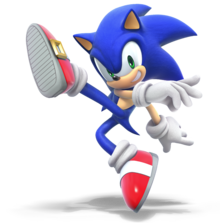 Sonic the Hedgehog is a blue hedgehog that moves at Sonic speed who joins Mario as they go head-to-head at the Olympic Winter Games! Armed with his signature attitude and Spin Dash ability on the Wii and DS, and Jump Dash ability on the DS, Sonic brings a new level of competition to the Olympic Winter Games as his team goes for gold in Vancouver! SONIC THE HEDGEHOG (1991) The world's fastest hedgehog, who can run at supersonic speeds. Generally speaking, he loves being able to do what he wants and loathes being constrained. Holding still is something he would never consider. He's got a bit of an attitude but can't pass by someone in trouble. When he collects the seven Chaos Emeralds, he transforms into the mighty, gold Super Sonic. SONIC THE HEDGEHOG 2 Sonic's Final Smash. The Chaos Emeralds give energy to all living things, and Sonic's gathered all seven of them, then used their power to transform into Super Sonic. His abilities in this form far surpass his normal ones, and he's even able to fly. He uses a lot of energy in this form, so he can only remain in it for a short time. Otacon: Snake, what is it? Otacon: ...? Oh, you mean Sonic The Hedgehog? But everyone loves Sonic. He's a big star. Do you have any idea how excited people are that he's here in Brawl? Snake: Yeah, yeah, I know, but there's something about him I just don't like. Otacon: But...why? You must have some kind of reason. Snake: ...Nope, just don't like him. The star of the Sonic The Hedgehog series. He's an easygoing hedgehog who blows past the competition with his speed. Seriously, on the ground he's faster than anyone else in Smash Bros. Use this to your advantage, avoiding blows while landing lightning-fast attacks. Wii U Sonic Lost World (10/2013) Sonic's up special Spring Jump lets him reach great heights by jumping on a spring, becoming invincible for a moment. He can't use any other specials during the jump, but he can attack or dodge. This move's great for returning from a long launch. Other fighters can use the spring, though! 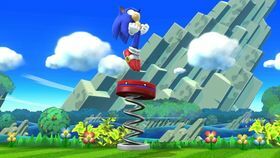 Sonic's Spring Jump up special lets you bounce to great heights and briefly makes you invincible at the start. You can't use other specials while in the air, but you can use normal attacks, dodge and so on. It's great for getting both back to the stage and out of tough spots, but just remember that everyone else can use the spring too! N/A The Chaos Emeralds are said to hold enough power to control the whole world. It's that power that turns Sonic into Super Sonic. He turns a glorious golden color and can fly at nearly the speed of light. In his Final Smash, this high-speed flight damages anyone who gets in its way and can even launch them! Pit: For being a hedgehog, Sonic really isn't very spiky, is he? Viridi: Yeah, I've seen spikier. It's true that you're more likely to find him curled up in a cute, harmless ball. Palutena: Not so harmless. That round shape lets him Spin Dash with ease. Pit: I've changed my mind. He's entirely too spiky. Viridi: Spin Dashes are hard to stop, though. Palutena: Just keep your cool and don't lose focus. You can stop Spin Attacks using your Orbitars or Bow. For this subject's image gallery, see Gallery:Sonic the Hedgehog. After Sonic's appearance in Super Smash Bros. Brawl, Mario was suggested to appear in Sonic & Sega All-Stars Racing early in development as an exclusive character for the Wii version. However, Sega didn't approve as they believed that it could conflict with the Mario & Sonic series titles. In Sonic's appearance in Sonic and the Black Knight, before the player starts a mission Sonic can be seen posing in a picture frame, Sonic's pose in that game is the same pose he used in Super Smash Bros. Brawl. 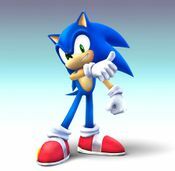 He also uses this pose in Sonic Generations, as Classic Sonic's B Rank pose. Near the end of Mario Takes America's development, the developers made multiple "backup" edits should they lose the Mario license. One of them featured Sonic replacing Mario. A downloadable level for the Wii U version of Sonic Lost World has Sonic make an appearance on Yoshi's Island. Sonic makes cameos alongside Bowser, Dr. Eggman, Ryu, and Zangief, in the Disney film, Wreck-it Ralph. In acknowledgement of Mario's 20th anniversary, Sega released an illustration on the Sonic Channel of Sonic wearing Mario's cap alongside text reading "20th HAPPY MARIO!" ↑ PushDustIn (July 24, 2016). Sonic the Hedgehog Joins the Battle!!. Source Gaming. Retrieved July 25, 2016. ↑ Exclusive Q&A with Sonic and Sega All-Star Racing's producers. Sega Nerds (Wayback Archive). Retrieved March 1, 2015. This page was last edited on March 31, 2019, at 09:52.